Neurologic symptoms are rare induced by atrial myxoma, which is the common cardiac benign tumor . However, the abnormal blood flow induced by atrial myxoma may cause severe and irreversible neurologic complications, such as recurrent transient ischemic attack and stroke. In young patients, the atrial myxoma inducing recurrent neurological events are more common than the older. In addition, atrial myxoma also leaded to obstructive cardiac symptoms by impaired the function of mitral valve . Here, we present a case of a 70 y old female who presented with acute onset loss of consciousness and flaccid hemiplegia on left side. Severe tachypnea, shallow respiratory pattern and bilateral decrease breath sound with crackle were found. The plain film showed borderline cardiomegaly. The electrocardiogram revealed ST segment elevation from precordial leads V4 to V6 and limb leads I and II. The emergency percutaneous coronary intervention disclosed patent coronary artery. The brain computed tomography showed recently infarction at cerebellum. Finally, an atrial myxoma was noted in cardiac ultrasound. This paper describes the clinical and image features of atrial myxoma and provided the possible hypothesis of atrial myxoma inducing pseudo-STEMI and stroke. We highlight the neurological and cardiac symptoms by atrial myxoma for physicians to early diagnosis and timely intervention. A 70 y old female presented with acute onset loss of consciousness about 30 min when she was shopping in the market. Her past medical history recorded poor controlled hypertension, diabetes mellitus and hyperlipidemia. There was no history of trauma. The syncope was not accompanied with uncontrolled jerking movement. Her vital sign revealed temperature 35.9°C, respiratory rate 22/min, heart rate 120/min and blood pressure was 160/102 mmHg. Initial Glasgow Coma Scale (GCS) was E4V2M1. On physical examination, isochoric pupils with fixed upward gaze were noted. The light reflex was sluggish reaction. The Relative Afferent Pupillary Defect (RAPD) sign was negative. Severe tachypnea, shallow respiratory pattern and bilateral decrease breath sound with crackle were found. There was no tenderness point at abdomen. The laboratory evaluation included: white cell count of 11830/μL (band form neutrophils 0.0%, segment form neutrophils 24.0%, lymphocytes 70.0%, eosinophils 3.0%, and monocytes 2.0%), hemoglobin 14.6 g/dL, platelet counts 175000 /ml, BUN 16 mg/dL, creatinine 1.3 mg/dL, sodium 146 mmole/L, potassium 3.7 mmole/L, glucose 123 mg/dL, alanine aminotransferase 88 U/L, albumin 3.2 g/dL, C-reaction protein 2.51 mg/dL, CK 480 IU/L, CK-MB 37 IU/L, troponin I<0.01 μg/L and FDP-D-dimer 1328.99 ng/ml. The venous blood gas analysis revealed pH: 7.390, pCO2: 33.5 mmHg, pO2: 139.1 mmHg, HCO3: 19.9 mmole/L, ABE: -3.37 mmole/L, BEecf: -5.1 mmole/L, and O2 saturation: 99.0%. The plain film showed borderline cardiomegaly (Figure 1A). The Electrocardiogram (ECG) revealed sinus bradycardia in 2012 (Figure 1B). Figure 1: (A): The plain film showed borderline cardiomegaly. (B): Previous electrocardiogram showed sinus bradycardia in 2012. The initial electrocardiogram in emergency department showed ST segment elevation from precordial leads V4 to V6 and limb leads I and II (Figure 2A). After loading aspirin and clopidogrel, the follow-up ECG revealed ST segment elevation at limb leads I and II (Figure 2B). The anterior and lateral subendocardial infarctions were suspected. The emergency percutaneous coronary intervention disclosed patent coronary artery. Figure 2: (A): The initial electrocardiogram showed ST segment elevation from precordial leads V4 to V6 and limb leads I and II. (B): The follow-up electrocardiogram revealed ST segment elevation at limb leads I and II. The cardiac echo was arranged to rule out valvular heart disease and showed a tumor mass (2.6 × 3.6 × 3.0 cm3) in left atrium with a stalk arising from interatrial septum. The impaired left ventricle systolic function and hypokinesis at left ventricle lateral and posterior walls were noted (Figure 3). Figure 3: (A): In left atrium, a tumor mass about 2.6 × 3.6 × 3.0 cm3 with a stalk arising from interatrial septum. (B): The turbulent blood flow in left atrium was noted with left atrial enlargement. In addition, the brain computed tomography was done due to the progression of flaccid hemiplegia on left side. There was no significant intracanal hemorrhage or mass effect (Figure 4). The brain magnetic resonance imaging revealed a patch of signal intensity change in the left cerebellar hemispheres, which was high signal intensity on DWI and low on ADC. The recently infarction at cerebellum was suspected. 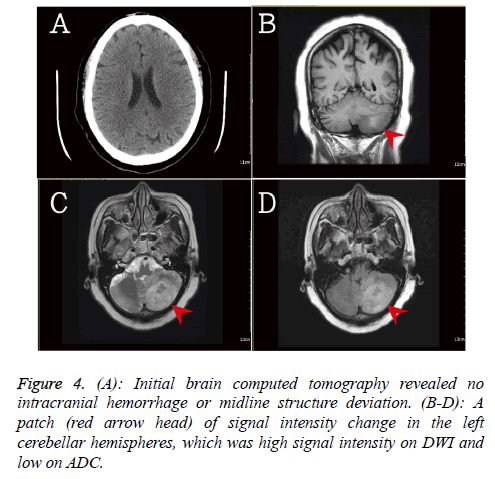 Figure 4: (A): Initial brain computed tomography revealed no intracranial hemorrhage or midline structure deviation. (B-D): A patch (red arrow head) of signal intensity change in the left cerebellar hemispheres, which was high signal intensity on DWI and low on ADC. According to above symptoms and image studies, she was diagnosed acute cerebellar infarction and pseudo-STEMI induced by atrial myxoma. She underwent emergency en-bloc resection of left atrial myxoma and received rehabilitation. After surgical intervention, her consciousness was improved and Glasgow Coma Scale (GCS) was E3VEM6. She discharged and kept rehabilitation at outpatient department. An oral informed consent was obtained from the patient. Cardiac myxoma, originating from multipotential mesenchymal cells of the endocardium, was the common cardiac tumor and accounted for 83% of total tumors [3,4]. The incidence rate of atrial myxoma was reported 0.0017% to 0.19% . Cardiac myxoma may cause the three major symptoms: obstructive symptoms, constitutional symptoms, and embolic symptoms . The obstructive symptoms were resulted from obstruction of cardiac outflow, leading to left heart failure, pulmonary congestion, mitral valve regurgitation or stenosis. The dyspnea, paroxysmal nocturnal dyspnea, and orthopnea were common reported. In severe invasion of myocardium, the cardiac arrhythmia may occur. In our case, the presentation of ST-elevation myocardial infarction was rare. We provided the hypothesis of atrial myxoma inducing cardiac symptoms. The giant atrial myxoma occupied the outlet and impaired the function of mitral valve. If sudden onset obstructed the outlet, the cardiac symptoms may occur, such as chest pain or tightness, and cardiogenic shock. The obstruction of cardiac outflow may also impair the depolarization and repolarization of ventricle. The ST segment elevation was noted in initial electrocardiogram, mimicking the acute myocardial infarction. The emergency percutaneous coronary intervention was done to confirm our hypothesis and disclosed patent coronary artery. The constitutional symptoms, such as malaise, anorexia, fever, arthralgia, and weight loss, were reported unspecific and sometimes confused physicians to connective tissue disorders. The abnormal laboratory data might be collected, including anemia, leukocytosis . Embolic symptoms were reported about 35% of all left atrial myxomas [3,7]. The giant mass may also lead to abnormal turbulent blood flow, causing micro-emboli formation. The mechanism is similar to atrial fibrillation. The emboli may cause neurological symptoms, such as recurrent transient ischemic attack and ischemic stroke. Occlusion of abdominal aorta, renal and coronary artery were also reported. Surgical excision has an excellent short and long term outcomes. The recurrent rate after surgical resection is approximately 1-12% . The surgical interventions can also resolute constitutional symptoms, but neurological complications may occur with lower rate. Surgical resection is current gold standard treatment for prevention of embolization. In this article, we describe the clinical and image features of atrial myxoma and highlight the early diagnosis and timely treatment for prevention of potentially neurological complications. Reynen K. Cardiac myxomas. N Engl J Med 1995; 333: 1610-1617. Pinede L, Duhaut P, Loire R. Clinical presentation of left atrial cardiac myxoma. A series of 112 consecutive cases. Medicine (Baltimore) 2001; 80: 159-172. Blondeau P. Primary cardiac tumors-French studies of 533 cases. Thorac Cardiovasc Surg 1990; 38: 192-195. Johansson L. Histogenesis of cardiac myxomas. An immunohistochemical study of 19 cases, including one with glandular structures, and review of the literature. Arch Pathol Lab Med 1989; 113: 735-741. Thyagarajan B, Kumar MP, Patel S, Agrawal A. Extracardiac manifestations of atrial myxomas. J Saudi Heart Assoc 2017; 29: 37-43. Jelic J, Milicic D, Alfirevic I, Anic D, Baudoin Z, Bulat C, Coric V, Dadic D, Husar J, Ivancan V, Korda Z, Letica D, Predrijevac M, Ugljen R, Vucemilo I. Cardiac myxoma: diagnostic approach, surgical treatment and follow-up. A twenty years experience. J Cardiovasc Surg (Torino) 1996; 37: 113-117. Lazaros G, Masoura C, Brili S, Stavropoulos G, Kafiri G, Stefanadis C. Large left atrial myxoma in an oligosymptomatic young woman. Hellenic J Cardiol 2013; 54: 60-63. Engberding R, Daniel WG, Erbel R, Kasper W, Lestuzzi C, Curtius JM, Sutherland GR, Lambertz H, von Hehn A, Lesbre JP. Diagnosis of heart tumours by transoesophageal echocardiography: a multicentre study in 154 patients. European cooperative study group. Eur Heart J 1993; 14: 1223-1228.